I am just so excited for today’s post, he he! I know your thinking what is she all crazy about? Food I suppose, well of course silly, you know how I get all crazy and happy over food! I have issues you know! But my Sunday night dinner was amazing, especially the bread I made! I am just so pleased with the outcome of it that I couldn’t wait to share it with you! I know, I know, bread again. Well you know I have to post a weekly bread recipe. But you know what? I got more, I also have the most easy wonderful pasta dinner. It’s my top favorite pasta dish! So simple, so flavorful, so mmmm, mmmm, good! Ok, here is my dinner I just have to share! I made Caprese Pasta, with a side of matching Caprese Quick Bread. See the bread in the corner? Oh baby! 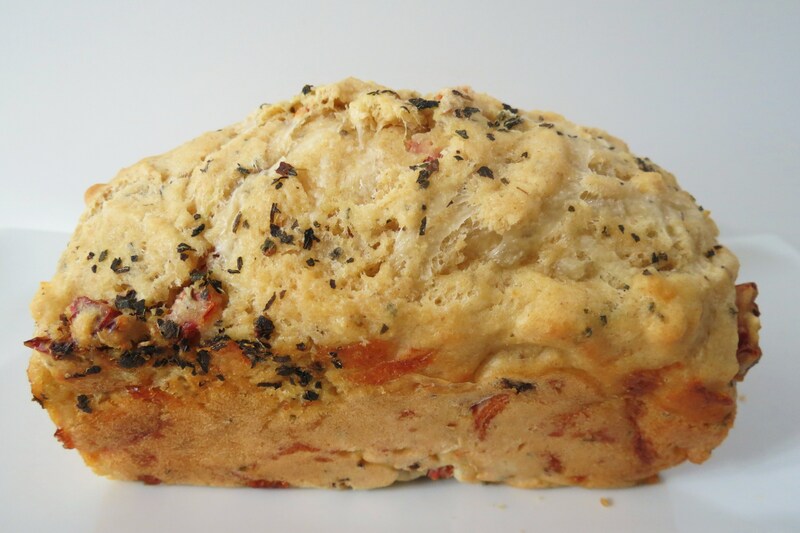 Tender, cheesy and a pop of sundried tomatoes. I am so happy with it! 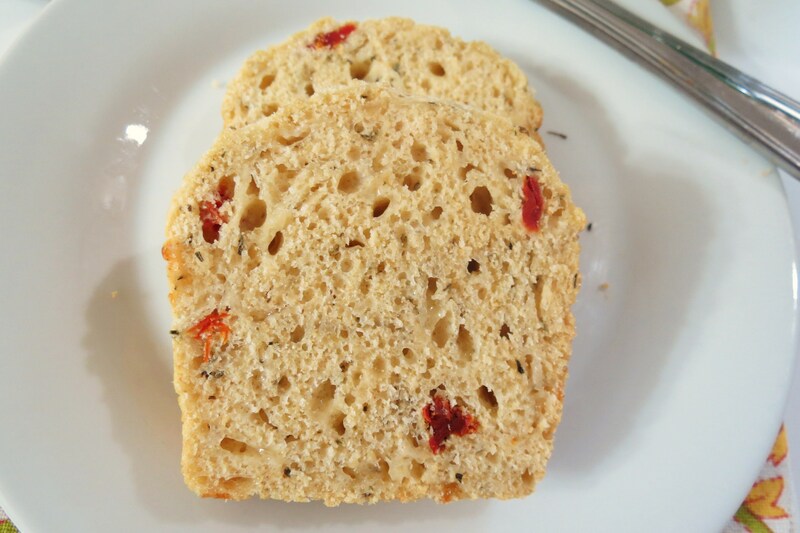 I think I may like it better then my Jalapeno Quick Bread and you know how much I love that bread. All those speckles is dried basil. The bread is super moist because I used 1 cup of milk and drizzled butter over the top before baking! We went to Macy’s today and we saw the Kitchen Aid pasta attachment for the mixer and ever since we saw that, pasta was on the brain for the both of us. Of course he’s thinking meatballs, sauce and cheese. Me, I’m thinking vegetables, maybe spaghetti squash, then I thought hmmm, I want refreshing. Needless to say he got what he wanted, and I got what I wanted. I made him pasta sauce with his frozen meatballs that he bought and I made myself pasta with olive oil, basil, tomatoes and Parmesan cheese. With his left over sauce and meatballs, he will make himself a meatball sub and I will fend for myself, and you know how much I love to fend for myself. Once pasta is done, add olive oil and toss till combined. 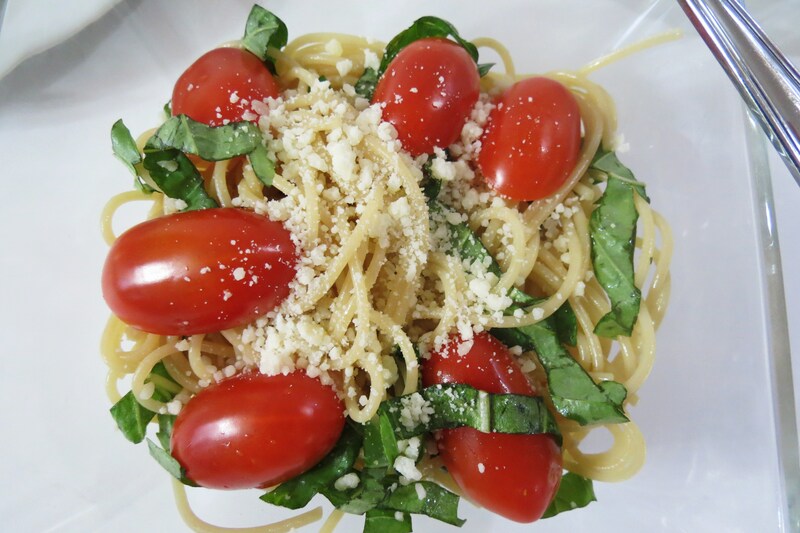 Add tomatoes and basil and top with cheese. Serves 1, but can easily be doubled or tripled. Not bad stats at all for pasta. 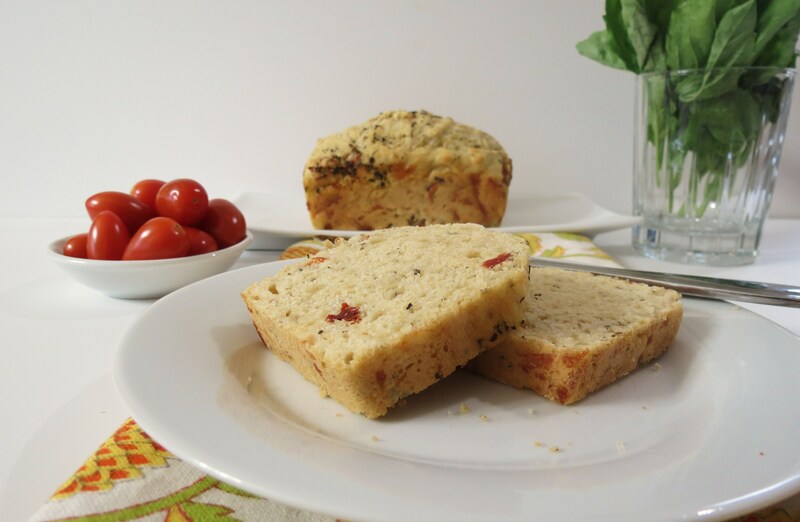 My Caprese bread, oh how I love thee! The basil and the sundried tomatoes really added all the flavor. The smell of the bread baking, took me back to a bakery in Tuscany, ok, I never been to Italy, nor have I ever left the US, but a girl can dream, can’t she? A little advice, when you add cheese to anything, weigh it! For me, if I used 1 cup like I suggest in this recipe in comparison to 4 oz in weight (1 oz of cheese is approx. 1/4 cup, according to package), I would of only used half the cheese. Sure less calories, but I didn’t know, I weighed my mozzarella and I had about 1/2 cup more on the scale! I’ll take more cheese, please! My kitchen scale is the most used appliance in my house. I weigh my yogurt because I get more yogurt in weight then if I were to use a 1/2 cup measuring cup. I also weigh my chicken and everything. That way I know exactly how much I am consuming. Of course that doesn’t stop me from stuffing my mouth every 10 minutes. Seriously, I do. So next time I complain about my weight, which I will, remind me to stop stuffing my face every second of the day! Heat oven to 350°. Spray a 9x5x3 loaf pan or two mini bread pans with cooking spray. Stir together flour, cheese, baking powder, basil and salt in medium bowl. Add olive oil, egg and milk, stir till combined. Fold in sundried tomatoes. 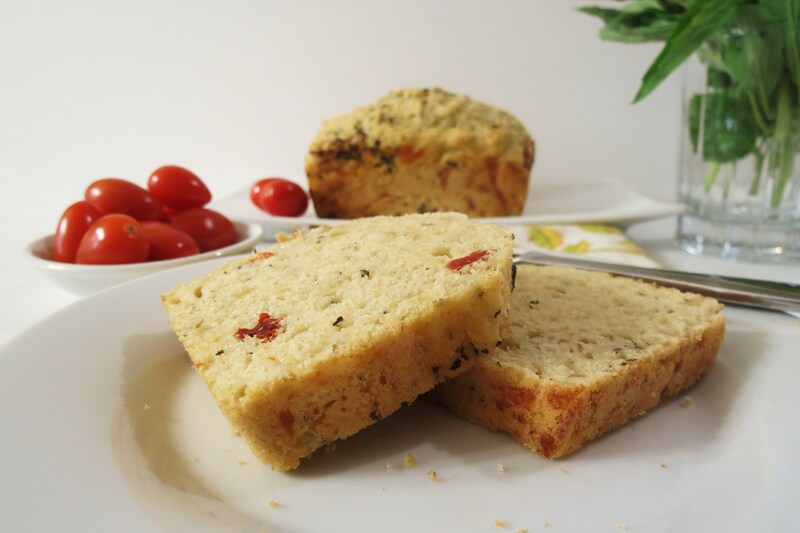 Bake 30 minutes for mini loaf pans and 40 – 50 minutes for large loaf pan, or until golden brown and toothpick inserted in center comes out clean. Cool 5 minutes, remove from pan to wire rack. Cool 30 minutes before slicing, if you can control yourself! So have you noticed anything new? I changed my format of my blog, I like it so much better then the format I had before. The pictures seem more clear and it’s easier to read. I was so afraid I would lose all my information when I activated this theme, but I didn’t! yah! I also added a new page, Fellow Bloggers. I added this page to show you the blogs that I enjoy. I’m not finished updating that page, but I’m slowly working on it. I hope you had a great weekend and you’ll have a fantastic week! I’m going to go finish watching the 49r’s game, therein overtime! Hope they make it to the Super Bowl. I guess by the time you read this, we’ll already know! See you tomorrow! It is caprese central around here today and I couldn’t be happier about it! Caprese is my favorite Italian flavor combo! I need that bread in my life. Like SERIOUS need. Whenever I only make 2 oz of pasta for a serving, I’m always surprised at how filling it is…and at how I used to think that at LEAST 4 oz was necessary for satisfaction! If you try it, let me know what you think! 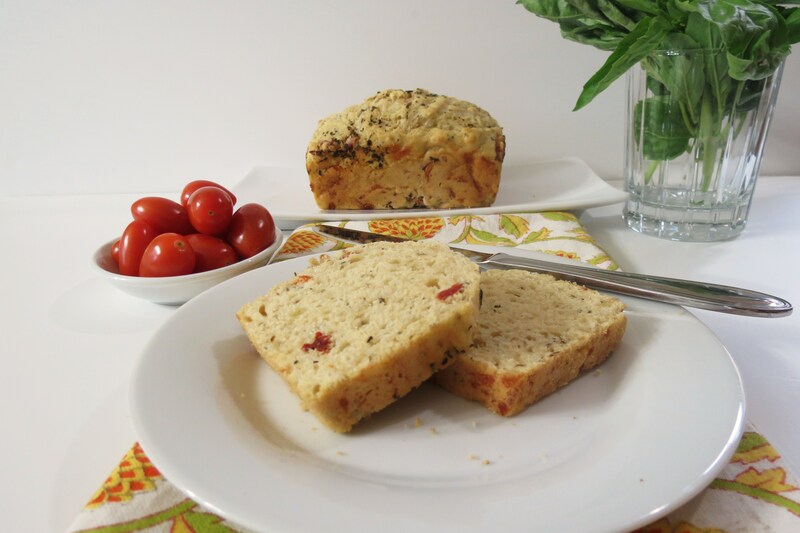 I love that you can make savory type bread with quick bread recipes. It seems we normally think of pumpkin or zuchinni breads. I like your new theme, looks good! Jennifer, I’d pick your pasta, too…but my guys would want meatballs. I’m going to have to look for that high fiber pasta at Trader Joe’s…it sounds wonderful. 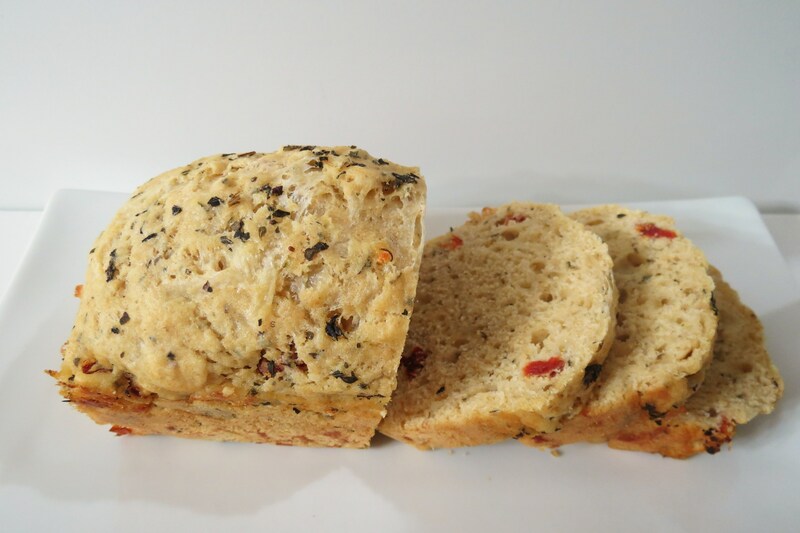 Your bread looks super, too! Oooh, Jennifer, I LOVE the new look! Your pictures look great – I love that napkin or whatever it is you have, and this sounds so good! What a delicious dinner! 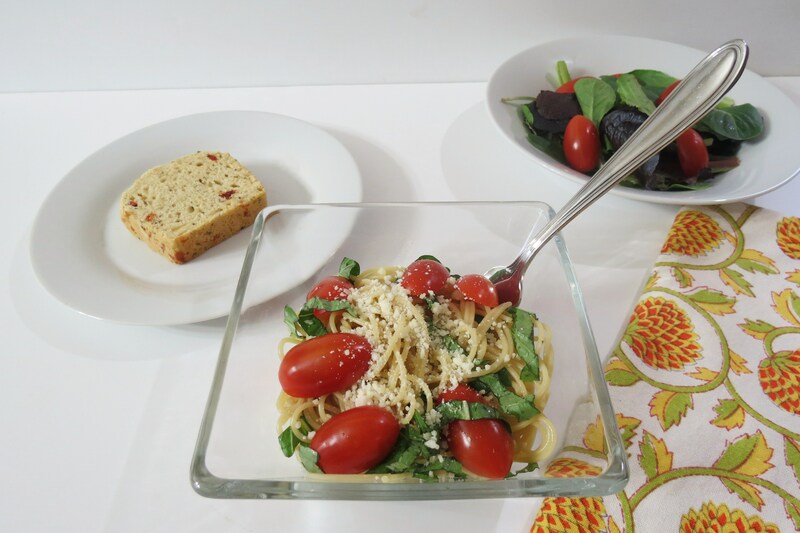 The bread looks amazing and the pasta is one of my favorite ways to eat it! YUMMY! Hi Jennifer! I love your blog! Healthy is always great. Your pics are great too! Italian food is just so comforting! 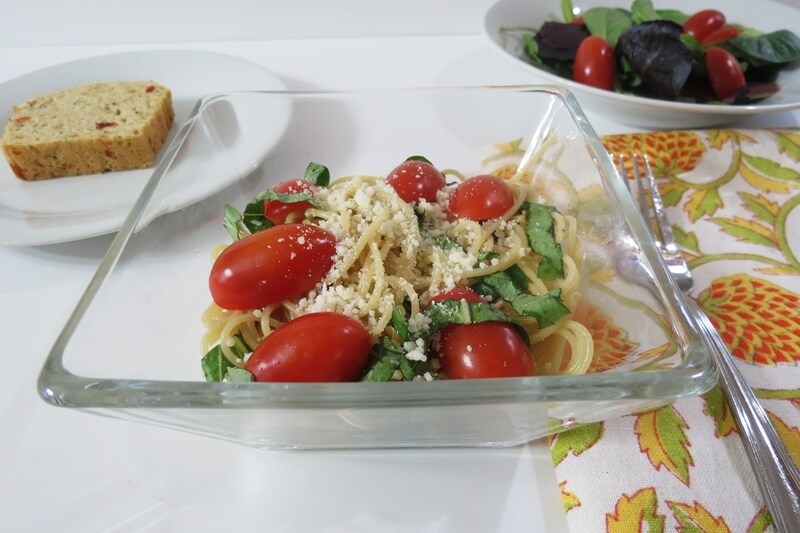 You can’t go wrong with pasta! 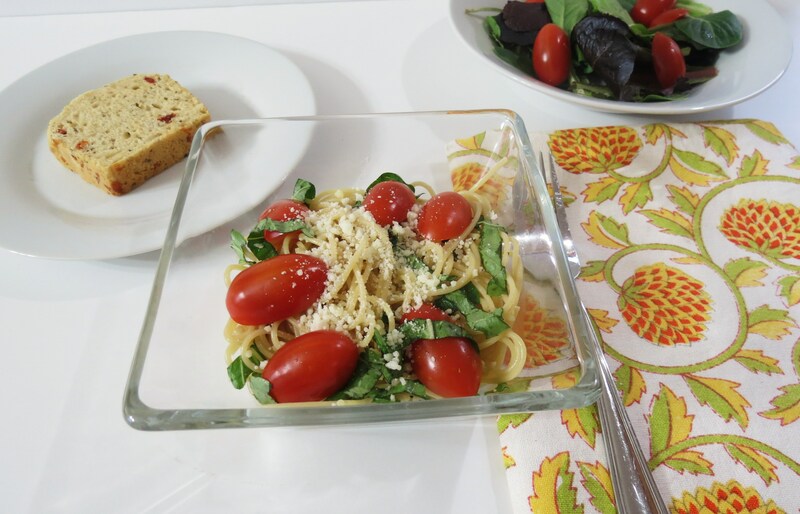 I love that this recipe is healthy and easy to make! 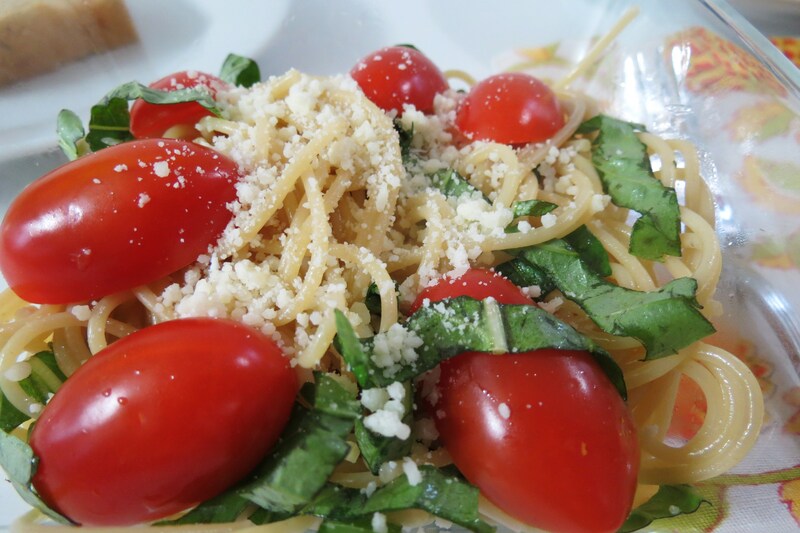 I prepare about the same pasta dish at home, usually after a long day of work. It is fast, delicious, super healthy and very comforting. It instantly lifts up your mood! I so agree with you! Healthy, quick and tasty is perfect in my book!